New To Aussies. 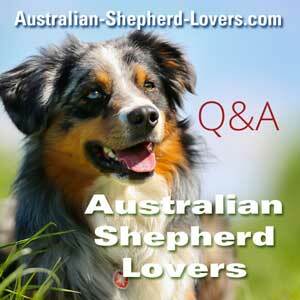 What Are The Differences Between Australian Shepherds And Boxers? So my wife and I are considering adopting an Aussie to sadly replace our dying Boxer. Can anyone speak to the breed difference, besides the obvious such as shedding, life expectancy and health? Comments for New To Aussies. What Are The Differences Between Australian Shepherds And Boxers? Dogs adapt to the home, hard to go wrong with a dog you love. We've had two full size Aussies over the past 23 years. Both came to us as adults. We now have a 3 month old miniature Aussie pup. The great thing is whether an Aussie or a Miniature they behave the same. Our pup shares a home with a 32 pound 4 year old terrier mix. They play attack for hours. We expect Brandy to be 25 to 30 pounds full grown. Aussies need a lot of activity and love to be with their humans. Think of having a shadow. They are smart as a whip and perfectly content to fetch a tennis ball indoors or out. Brandy is a chow hound or an apatite on legs so watch their diet. I have mobility issues from a spine injury. Doogy our older dog more than compensates for keeping the pack active. Enjoy your Aussie if you choose one. It will be a joyful package of love and loyalty at full throttle.